Owing to increased vulnerability and climatic extremes, we are faced with the rapidly growing impact of disasters worldwide. There is an urgent need to incorporate the concepts of disaster risk management into planning, sustainable development and environmental impact assessment. Disaster risk management requires the assessment of risk, which is a multidisciplinary endeavour. 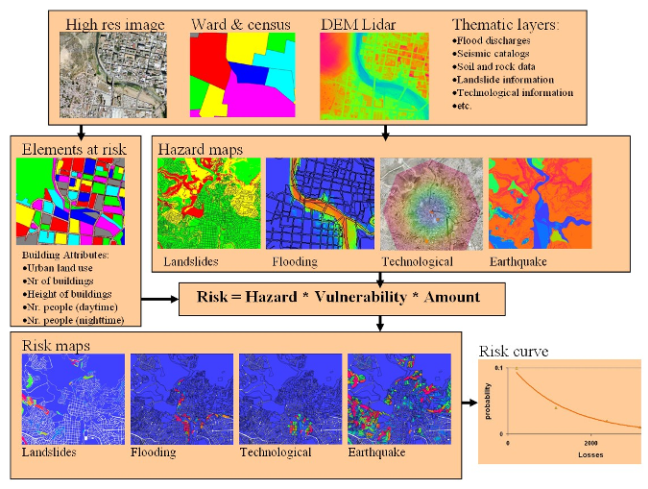 The course explains how to conduct a risk assessment using spatial information on hazards, elements at risk and vulnerability with the aid of GIS and remote sensing, and how this information can be used in risk management, with a focus on urban areas. For whom is the course relevant? This course is designed for all those who have to carry out risk assessment and require knowledge and skills in using a GIS to handle the necessary the procedures, such as professionals working in governmental and non-governmental organizations, planners, engineers, architects, geographers, environmental specialists and university teachers. Some basic background in GIS is desirable, although not strictly necessary as the course follows a step-by-step approach that enables participants to rapidly acquire the basic skills in handling GIS software. understand how risk assessment is used in risk reduction and disaster preparedness. The course is composed of a number of sessions. Each session has a PowerPoint presentation and a document introducing the session topic. Each session also has exercises and assignments, including maps or materials to be handed in. The course is based on a study load of one module of three weeks (5 ECTs), which is offered in online form over a period of six weeks. Below is a summary of the sessions and detailed content. 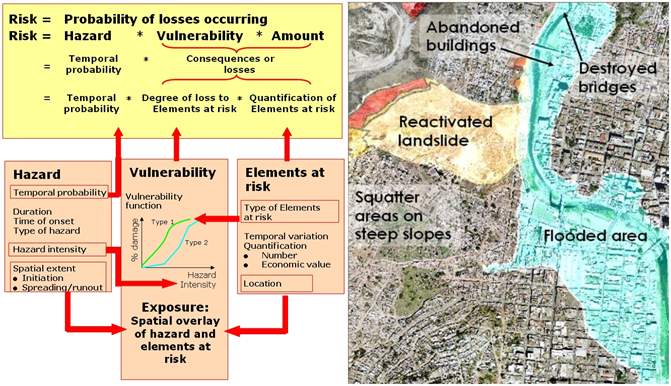 Creating risk curves; selection of risk assessment method: flooding, earthquakes, landslides, technological hazards. How to do such a study in your area? The course has been designed over a long period of time and has been tested many times in different countries. It is based on a course book with assignments and an exercise book with GIS exercises. Active interaction with lecturers and fellow students takes place via internet. The general approach of the course is task-based learning that blends theory and practice. The study load is 20 to 24 hours per week. All materials including (most of) the software will be provided online in ITC's digital learning environment Blackboard. Most materials will be sent on a DVD to enable convenient offline study. Online learning, what is it like? The general approach of the course is task-based learning which blends theory and practice. The study load is 20 to 24 hours per week. All materials including (most of) the software will be provided online in ITC's digital learning environment Blackboard. For convenient offline study most materials will be sent on a CD-Rom. We will use email for individual communication and a discussion board in Blackboard for group communication. Upon successful completion of this course you will receive a Certificate which will include the name of the course. Along with your Certificate you will receive a Course Record providing all the subjects studied as part of the course. It states: the course code, subject, ECTS credits, exam date, location and the mark awarded. If you decide to follow a full Postgraduate or Master's course at ITC, and after approval of the Examination Board, you will be exempted from the course(s) you followed successfully as an online course. Applicants for an online course should have a Bachelor degree or equivalent from a recognised university in a discipline related to the course, preferably combined with working experience in a relevant field. Applicants for the online education programme must have elementary computer experience, regular access to internet and e-mail. For some courses additional computer skills are required (see description of specific course). Most online courses, except for the introductory course, require knowledge of, and skills in, working with GIS and/or digital image processing of remotely sensed data. Candidates are asked to provide proof of identity during the registration process. Since the computer is used for both the practical exercises and the communication via the internet you are expected to have a computer capable of running ILWIS (standard PC or laptop is OK) and an internet connection. The course is made for the Open Source GIS software ILWIS (Integrated Land and Water Information Systems. The Open Source software is free and will be supplied on a DVD, together with the data sets and training materials. You will also work with Blackboard (educational software) and with Microsoft Office (Word and Excel). What more there is to know? This online course is based on a module of one of ITC's degree courses. Successful completion will lead to exemption for that course in the degree course. The course is developed by a group of people. Coordination is by Dr. C.J. (Cees) van Westen.